"I finally have found comfort with this identity, 'cause I'm never going to outrun it. It's always going to be there ahead of me." Brady Home Movies originally aired on the CBS television network in 1995. The program compiles a number of home movies shot by the young Brady Bunch cast members with Super 8mm cameras provided by Robert "Mr. Brady" Reed, along with interviews and vintage TV and film clips featuring the surviving members of the popular TV series' cast (Robert Reed having passed away in 1992). Though the "home movies" are the featured attraction, there isn't enough 8mm footage to fill this forty-two minute special—some of the clips are reused several times, and they're not exactly chock-full of revelatory content. They're typical home movies, mostly of fellow Bradys goofing around like any kid in front of a camera, refreshingly candid and fun but insubstantial. The meat of the show is provided by new interviews with Susan "Cindy" Olsen, Florence "Mrs. Brady" Henderson, Ann B. "Alice" Davis, Barry "Greg" Williams, Chris "Peter" Knight and Mike "Bobby" Lookinland. Olsen was one of the producers of this special, and she succeeds in extracting warm, affectionate, humorous anecdotes from all involved. Most of the cast is involved in an informal reunion, with lots of shared memories and good-natured arguments; Maureen "Marsha" McCormick and Eve "Jan" Plumb were apparently less involved, represented by a few new clips but not participating in the reunion segment. Most of the others contribute honest, articulate thoughts about their involvement with the show, and it's nice to see that these show-business kids have grown up to be reasonably well-adjusted, productive adults. Though Rhino's DVD packaging claims the special has been re-edited, there are still obvious commercial breaks and fadeouts that disrupt the program's flow. There's not much new information here; Brady Home Movies is an upbeat, nostalgic special that doesn't allude to any on-set tensions, production problems or other "juicy" issues that Brady fans haven't heard a dozen times before. And Robert Reed's death is covered more briefly than the group's obvious respect for the man would seem to merit. But it's a fun little program overall, unpretentious, intimate and straightforward; it's not likely to hold up to repeat viewings, but anyone who grew up with the TV show will find some interesting material here. Image Transfer Review: Rhino's DVD preserves this television special's original 1.33:1 full-frame aspect ratio. Mastered from broadcast-quality videotape, the disc features a fine image, with solid color and sharper detail (in the newly-shot video footage) than most TV material I've seen on DVD. The "home movies" themselves are in middling condition, shot on Super 8mm film with a lot of grain and dirt, but this is to be expected; they're presented at the proper 18 frames-per-second rate and look fairly natural. Some vintage commercial and TV clips suffer from fading and damage, and one movie clip (of Susan Olsen in an Elvis Presley film) is obviously panned-and-scanned, but this is a nice looking transfer considering the varying sources. Presumably the show's short running time allowed for a high-bitrate digital transfer; whatever the reason, this program looks terrific on DVD. Audio Transfer Review: Brady Home Movies features a simple, television-grade Dolby Digital 2.0 audio track. It's largely monophonic (ProLogic-decoded to the center speaker) in character, with just a bit of stereo separation on background music. The new interview audio is generally clear and crisp, with some understandable muddiness and noise on vintage clips; the "home movies" were silent originally and are accompanied by stereo stock music here. This is a recent program and suffers from no unexpected hiss, crackle or other audio defects; nothing to shout or complain about. Extras Review: Rhino presents Brady Home Movies simply but stylishly, with nicely animated menus, 15 picture-menu chapter stops, and a supplementary interview with Susan "Cindy" Olsen and Mike "Bobby" Lookinland, provided with 9 text-menu chapter stops of its own. This 24-minute interview (newly shot for the DVD, judging from the Iron Giant poster in the background) is more-or-less unstructured, rambling from one topic to another with little direction or focus; it's fun to watch the grown "youngest Bradys" reminiscing, but not terribly informative. 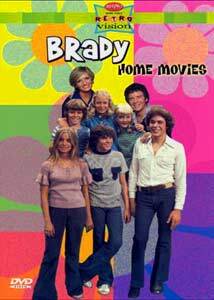 Brady Home Movies is a fun view for Brady Bunch fans, reuniting the surviving cast members for an upbeat, fairly personal look back at the popular TV series. Rhino's DVD looks just great, though supplements are limited; a worthwhile rental for fans, a purchase for diehard Bradyites only.